Tracy and Steve Schuster, 2017 Super Mod Cup World Series Champions, share 28 of their best storage mods from throughout their Lance Camper. Fellow mod-maniacs, this is the mod-er load! What better way to kick off the 10X10 Mod Tournament than with an all-out s’mod-gasbord (Swedish for a gluttonous mod buffet) from none other than Tracy and Steve Schuster? That’s right mod fans, the 2017 Super Mod Cup World Series Champions have sent in a bonafide mod-ley for your mod-spiration and mod-joyment! Okay, I’ll stop. In a mod-minute. 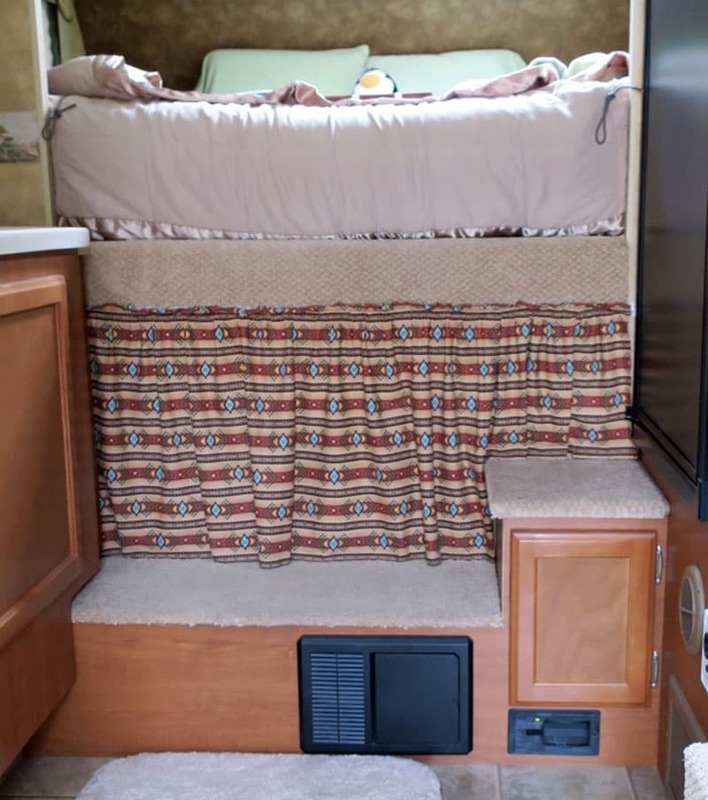 Seriously folks, the Schusters are master mod-makers and have put together one heck of a presentation – camper room by camper room – featuring darn near everything they’ve done to improve the storage in their truck camper. It’s a mod-el of what’s possible. Dang it! Did it again. 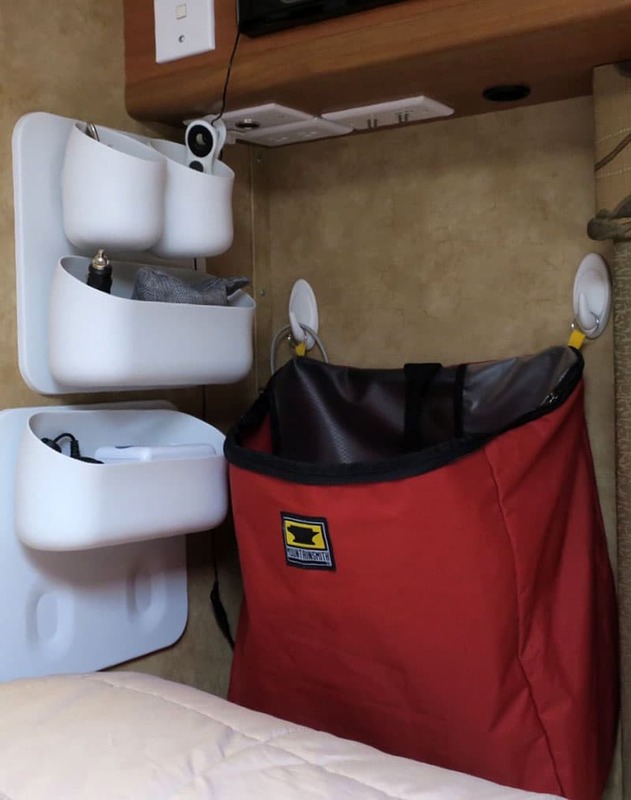 Mod 1: I installed closet organizers in the cabover wardrobe. 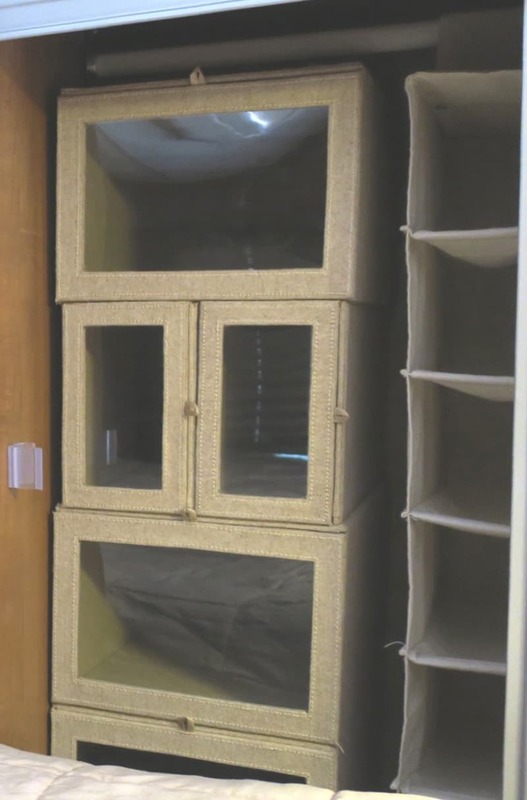 We took some fabric covered storage boxes with flip-down lids from the Container Store and screwed them together. They are configured in a way to fit the wardrobe closet as well as meeting our different clothes storage needs. This season we’re adding plastic baskets that fit perfectly inside each box (also from the Container Store). Our clothes will be easier to access, especially those illusive t-shirts you put on the bottom or to the back of the pile, but just have to wear that day. Mod 2: We also added hanging fabric shoe caddies on to the hanging bar to hold socks, undies, and other smaller items. These too will get their own form-fitting bins this year. Mod 3: We took out the mattress and put in a Sleep Number mattress. 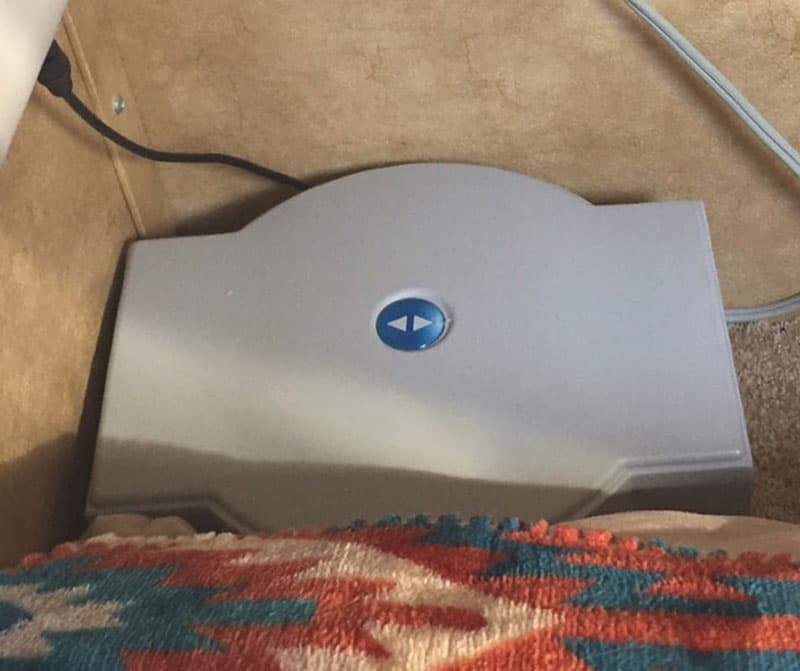 It makes sleeping in the camper even better! We never have to leave the sleeping comforts of home. We just set our sides like we do at home and we’re sleeping like babies from night one. Mod 4: We added a curtain all the way across the wall to hide the window and replace the curtain that was offset in the wall. The fabric matches the headboard that we also recovered to be more to our liking. Mod 5: Command adhesive heavy duty hooks hold up the Mountain Hardware canvas bag that already comes with hoops on each end so it’s perfect for hanging. We keep extra huge-sized ziplocks in the bottom of the hamper for sealing our dirty clothes in, and empty the hamper every couple of days. There are no smelly dirty clothes and no mess! 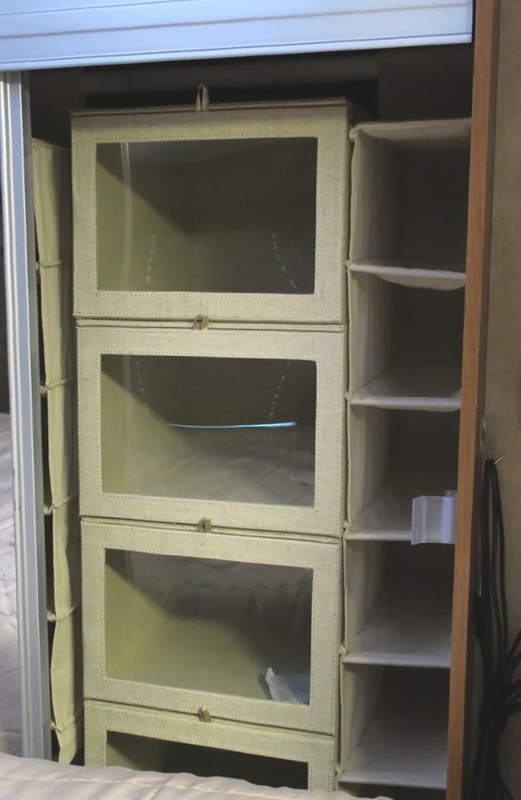 Mod 6: We also took out the tiny television and added a set of highly adjustable magnetic cubbies for holding small items and spare cords, etc. 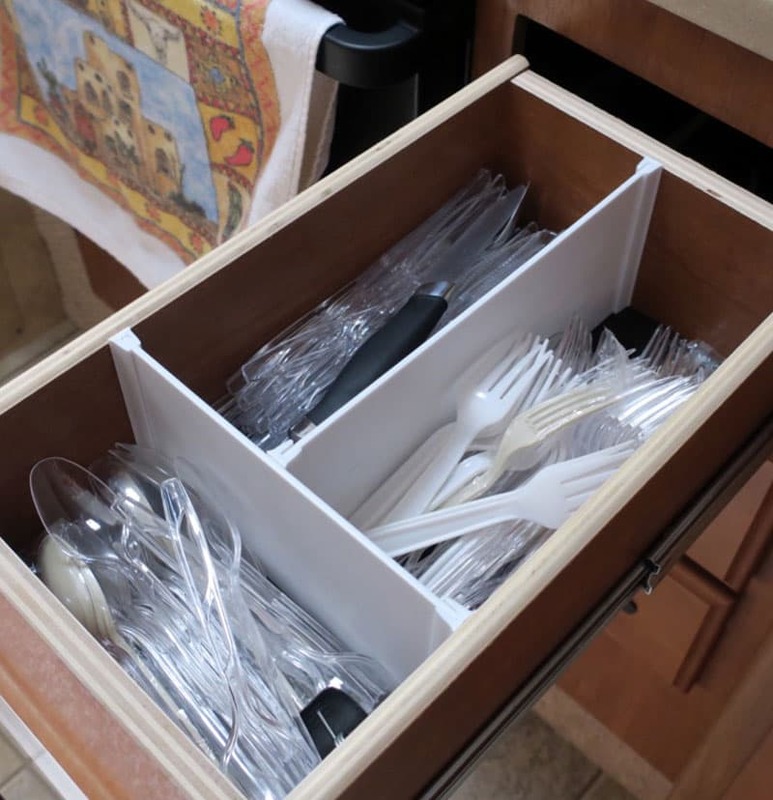 Mod 7: No silverware or other divider set fit the drawers or our utensils well so we added plastic dividers that you cut to fit in any configuration you want. Then we attached it to the inside of the drawer.